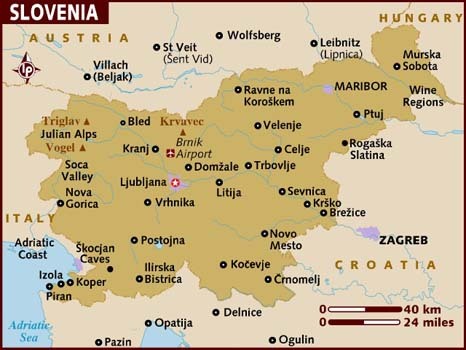 Slovenia is a small country, lying in the heart of Europe, where the Alps meet the Mediterranean and the Pannonian Plain meets the Karst, bordering Italy, Austria, Hungary and Croatia. The capital city is Ljubljana. The collision of four major European geographical units has created a very invigorating landscape, much of it thickly forested (it is the third most forested country in Europe - almost 60% of its territory is covered by forest). Some of the country’s 9,000 karstic caves are among the most beautiful in the world. The Postojna Cave is the best known one. 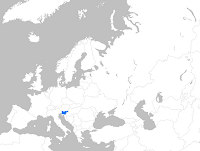 In fact, Slovenia's Karst Plateau has given its name to karst landscapes and karst phenomena all over the world. Although over one third of Slovenia's territory is protected and included in the Europe-wide Natura 2000 network, the only national park in Slovenia is Triglav, home to Slovenia’s highest mountain, named also Triglav, which stands 2,864 metres high. Slovenia's natural environment suffers from damage to forests by industrial pollutants, especially chemical and metallurgical plant emissions and the resulting acid rain. Water pollution is also a problem. The Sava River is polluted with domestic and industrial waste; heavy metals and toxic chemicals can be found in the coastal waters. As of 2008, 6.6% of Slovenia's total terrestrial area was protected. In 2001, 10 out of 75 mammal species and 3 out of 207 breeding bird species were threatened, as were 3 plant species. Threatened species include the Italian agile frog, slender-billed curlew, Beluga, Danube salmon, and the olm. The four priority areas for Slovenia are: improving the state of the aquatic environment, through reducing pollution; coping with the problem of waste by reducing waste generation and setting up an effective waste management system; conservation of biological diversity; and protecting air quality and climate. 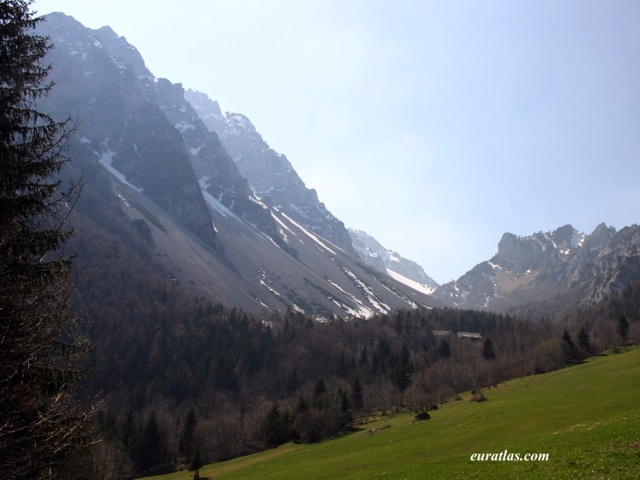 The most likely climate changes in Slovenia will be towards warmer and drier summers, warm winters with a similar quantity of precipitation and a higher frequency of extreme weather events. The higher temperature, different water balance and more frequent extreme weather events will affect agriculture, forests will be exposed to increased stress, biodiversity will be threatened, the threat of floods will increase and there will be problems ensuring the supply of drinking water, risks in Alpine and other mountainous areas will increase, while the rise in sea levels and sea temperature will threaten coastal areas. Slovenian citizens quite readily engage as members of CSOs and as volunteers. The rise of volunteering seem to be the result of efforts invested by voluntary organisations toward establishing a regulatory framework to provide systemic support for the development and implementation of voluntary work at national and local levels. A law on volunteering, which was to address the rights of volunteers and provide systemic support for volunteering, was passed by Parliament in 2011. It stipulates the formal rights of volunteers, the obligations of CSOs and the systematic means of volunteerism support from public sources. 2.7% of Slovenian citizens are active members of environmental organisations. Volunteering is on the rise, mainly as a result of intensive and systematic promotion and development efforts that have recently been supported by government grants, such as a grant for the promotion of voluntary work given by the Ministry of Public Administration in 2009. There are many CSOs that have a specific mandate to promote environmental sustainability on the regional and national levels. Coalitions were also formed to gather organisations working on this issue and those that are dedicated to achieving common goals. The general opinion is that civil society has a significant or moderate role in protecting the environment in Slovenia. A significant role of CSOs was noticed when organising educational activities and publishing brochures and reports on environmental protection, especially taking into consideration the fact that there is a lack of such content in schools. As a result, civil society has managed to fill this gap, mostly by collecting and distributing information concerning environmental sustainability. According to OECD there are about 17 environmental taxes in Slovenia, among which 4 regard fuel and vehicles, 5 regard water, 5 regard waste, while the remaining 3 refer to energy efficiency and pollution (CO2 and VOC). There are also some environmentally motivated subsidies with the purpose of: waste minimization, encouragement of environmental protection by giving loans and guarantees for environmental investments and other forms of assistance, improvement of municipal infrastructure for waste water, drinking water supply and waste management and incentivize renewable energy sources and energy efficiency projects (for households and companies). A tradable permits system with the aim to reduce CO2 emissions is also in place. National Forest Programme (2007) provides measure by which it is possible to cut more wood in Slovenian forests and at the same time protect their sustainable preservation and development. Rural Development Programme of the Republic of Slovenia 2007-2013 provides measures to ensure the sustainable use of water (quality and quantity) and agricultural land and protect the biodiversity. Biodiversity Conservation Strategy of Slovenia (2001) stresses the approach of in-situ biodiversity conservation with the main stress on the conservation of ecosystems by preserving a favourable status of the relevant groups of plant and animal species and habitat types. Water Management Plan (2009-2015) provides measures for each pressure and each river basin to sustain quality and quantity of water resources. National Strategic Plan on the Development of Fisheries 2007-2013 determines the priorities for the development of fisheries and aquaculture in accordance with the common policy, providing a balanced and sustainable development of the sector. Resolution on the National Energy Programme, 2004 lays down the objectives of the energy policy: competitiveness of the energy companies, the economy and the Government, reliability in providing energy services and reduction of environmental impacts. National Energy Efficiency Action Plan, 2008-2016 determines the measures for improved energy efficiency. Different instruments in all sectors are foreseen in order to achieve the overall energy savings in Slovenia. Action plan on renewable energy resources for period 2010-2020 assesses and determines the necessary quantitative values of use of energy from renewable energy sources in individual sectors. National Mineral Resource Management Programme – General Plan: National Mineral Resource Management Programme (2009) addresses efficient mineral resource management. Operational programme on elimination of wastes has the objective to reduce the quantity of biodegradable disposal wastes. In 2009, environmental taxes represented 3.6 % of GDP, the third highest in the EU. This share rose mainly due to increasing revenues from excise duties on mineral oil and gas. As in most countries, taxes on energy account for the lion's share of environmental tax revenues, which are high also in the international comparison as Slovenia ranks first in the Union in this respect. Despite their lower absolute revenue, pollution/resource taxes, too, are well developed in Slovenia, taking the seventh highest level in the EU. The Corporate Social Responsibility Study showed that out of the ten biggest companies in the country, nine publish their annual reports on the internet and majority of them included a chapter on CSR. All of them were either donors or sponsors of other organisations or individuals. Sponsorship is most common in the field of sports and culture, while donations are often given to organisations helping children, poor people and those dealing with educational issues. Half of these companies have already acquired recognition from International Organization for Standardisation for their environmental protection achievements. Moreover, they are quite active in the local communities. Approach to environmental care was described in detail in eight cases. In general this issue is also always present in annual reports. When describing environmental care as value, suitability development is mentioned quite often. The term includes different categories of careful approach to environment, such as energy saving technologies, economic treatment with raw materials, lowering quantity of waste and recycling. As far as smaller companies are concerned, 67% were involved in a social responsibility action at least once. The lack of external motivation, such as support from the government, was mentioned as one of the obstacles to further involvement in socially responsible activities, for example, through sponsorships, based on the assumption that the private sector would support CSOs more if government would show some support as well. Social responsibility appears to be more and more important for the largest companies, as they are increasing the number of their social responsibility activities, promoting them in the media and working to improve their image among consumers and business partners.